I'd like to nominate the English-language edition of the Tokyo 2020 Candidate City website as the worst English-language site in the world. The site is built in support of bringing the 2020 Summer Olympic Games to Tokyo. Where to start. Well anywhere, really. So let's look at content. "Tokyo 2020 will bring together dynamic innovation and global inspiration. It will unite the power of the Games with the unique values of the Japanese people and the excitement of a city that sets global trends. It will be a unique celebration that will help reinforce and renew the Olympic Values for the new generation. And will contribute to more young people, worldwide, sharing the dreams, hopes and benefits of sport." This is about as gobbledygook as any paragraph I have ever read. And I've read a lot of bad ones over the years. We've got weasel words like the number one most over-used phrase in English language marketing: "innovation". Then there’s "global inspiration," "unique values" plus other world-class, cutting-edge, mission-critical nonsense. These phrases are so overused to have become meaningless. A fun test of superlative-laden content like this is to substitute a competitor. So how about substituting into the paragraph above for Istanbul 2020 with the words "Istanbul / Turkish" or Madrid 2020 with "Madrid / Spanish." If the paragraph still makes sense with the competitor city substituted, then vision has failed. While I could poke at additional content aspects of this terrible site that make it stink so much, I'll stop. Because what it really comes down to is the typical mistake of not understanding buyers. I lived in Japan for seven years and my wife is Japanese. What we've seen so often is Japanese organizations that enter the global markets by simply translating the content they created for the local Japan marketplace. That's likely what happened here. And it's too bad, really. Because Tokyo would make an excellent host city. But I fear the candidacy is doomed because of this rotten site. For an example of missing the buyer persona, consider the use of animated characters that are so big in Japanese marketing. 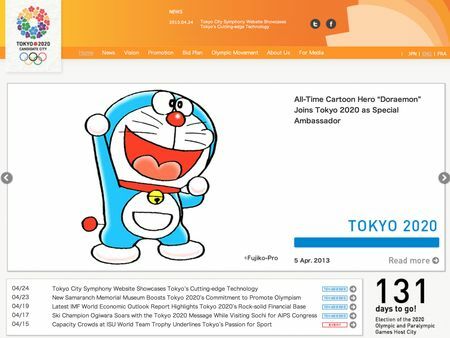 The people who made this site assumed that everyone in the world is attracted to anime so they carried it over to English too: All-Time Cartoon Hero Doraemon Joins Tokyo 2020 as Special Ambassador. Well not everyone is into the same stuff as the average eleven-year-old. Who should be the buyer persona for this site? I'd argue the 115 voting members of the International Olympic Committee who choose the location of the 2020 games are the most important buyer persona. I'd have a tough time believing that this site reaches those people effectively. While it is easy to sneer at this site and other crap-filled sites like it, imagine what happens when *you* simply translate *your* materials into the local languages of countries whose markets you enter. It is likely a similar thing happens to your site in the eyes of the local market if you translate your content. To really globalize, you need local content creators who understand the local buyer personas and create content especially for them. Voting for the Olympic host city takes place on September 7, 2013, as I write this a little more than 4 months away. There is still time to fix this site and increase Tokyo's chances. UPDATE May 2, 2013 - I am not a consultant (I write books and deliver speeches around the world). I have no interest in trying to generate consulting business from this blog post. I am simply pointing it out so we can all learn from it.